Books > Hindi > हिंदू धर्म > महाभारत > Folk Theatre Pandwani "Based On The Epic Mahabharata"
Pandawani is a monodramatic form of chhatisgarh which originated among the Pradhan gond tribe as a long ballad. Gradally it evolved into a theatre form. In its original form it contained many Gond myths and ethnographic elements. But gradually those elements were weeded out and the theatrical performers adopted the text of the Mahabharata of Sabal Singh Chauhan which is in Avadhi language and written in 'Doha-Choupai' metres. The beauty of the form is every performers improvises the text in his own way and everyone has his own way and everyone has his own style of performance. Pandwani theatre now is estabilished throughout the world. In the year 1984, 1985, 1987 and 1988 Madhya Pradesh Adivasi Lokkala Academy organized Pandwani festivals at Bhopal, Raipur, Durg and Raipur respectively. In this search programme more than 50 pandwani parties were identified. This shows that unlike other folk theatre forms of India, Pandwani is still flourishing. The author did his post-graduation in economics in the year 1960 from sagar University went to Bastar in 1962 to look after their family business of rice mill. He was fascinated by the tribals and their way of life. While living in Bastar he developed interest in anthropology and culture. Gradually, he developed interest in the tribal culture and various art forms of Central India and since last fortyfive years he has been documenting tribal and folk ways. On the basis of his work which is spread in more than four decades span of time he has planned five books on tribal and folk arts, eight books on folk theatre, four monographs on tribes and three-four books on folk tales and folk songs and ballads. All these works will be appearing soon gradually. The author has a very large collection of artifacts of his own which includes tribal bronzes from Bastar, Chhattisgarh, Orissa, Jharkhand and West Bengal. He has also a large collection of folk and tribal paintings, artistic wooden tribal combs, tribal ornaments and other ritual objects. He has gifted his collection of terracotta artifacts numbering about six hundred of Central India to the Anthropological survey of India Museum at Bastar. The author has published fifty articles on various subjects of tribal art, folk theatre, folklore and some tribes. He was the executive committee member of Madhya Pradesh Adivasi Lok Kala Parishad as an expert on tribes for eight years. He was on the advisory board of Choumasa for twenty years, a journal of the M.P Adivasi Lok Kala parishad. He has been a member of South Central Zone Cultural Centre for eight years in all its committees as an expert on tribal and folk culture. Presently, he is engaged in finalizing his works for publishing. He is also working on the encyclopaedia of folklore of North Indian Languages. Pandwani is a powerful mono theatre from of chhattisgarh. I have been fortunate to see it from my school days. An old beggar used to come to our house in Dhamtari town with a tambura (a string instrument) and what was he singing we were told that it was ‘Pandwani’. After some years when I was studying in high school. I saw an enactment of days I was more attracted towards ‘Naucha’ a complete theatre from because it was full of humour. When I came to Raipur in the year 1955 for my college education. I got more opportunities to witness performances of Naucha and Pandwani, by so many artist. Once I saw Punaram Devangan performing Pandwani in front of a small temple platform. He was wearing only a dhoti and upper part of his body was naked. He had a very handsome figure, and built like an athlete. He had long shinning dark black hair. His copper complexion was very charming . He was wearing a garland of flowers and also armlets made of flowers. He was performing in a sitting ‘virasan’ posture. Although his facial expression were not so impressive but his robust physical actions were so powerful that he was able to create the Mahabharata characters very impressively. I do not now remember exactly what episode he was enacting, but it was definitely related to fight between warriors. His performance made me interested in pandwani performances of Jhaduram Devangan and Laxmibai on the outskirts of Raipur city, which were domnated by Chhattisgarhi speaking population. My first meeting with Teejanbai was accidental and interesting enough. I went to the Raipur bus stand to give send off to a relative. From another bus a troupe of rural perfomers were getting down. Teejanbai was carrying a harmonium on her head and a tambura in one hand. Similarly, someone was carrying table pair and some others their respective musical instruments and luggage. I asked them, ‘who they were and what do they perform?’ The senior most person told me that they were Pandwani perfomers. I offered them breakfast in a restaurant close to the bus stand. I asked Tijanbai some question about her rendering. She relpied, “sahebji, how can we describe about our own performance. We are simple villagers. Better see our performance.” She told me that her programme on the same day was to be held on the bank of Shanichari tank on the outskirts of Raipur city itself. I went there with a journalist friend and saw her performance. She was very happy to find us there. Her host offered us tea and some snacks. I invited the troupe to my place next morning for a treat. That was beginning of our interaction. Teejanbai and her troupe came to my place on two cycle rickshaws and stayed with us for one full day and night. I requested a journalist friend, Sudhir Saxena, to interview Teejan Bai. A friend of mine photographed her. This interview was published in several newspapers. In the night I arranged her performance before our family members and close friends. In the eighties I informed about her to Ashok Vajpayee who was then the Secretary in the ministry of Culture, in the Madhya Pradesh Government. Her first performance in Bhopal made the audience spellbound. Her robust mimes and uninhibited acting thrilled everyone. Since then she has not looked back. Jhaduram Dewangan was another great performer. His fine gestures and sharp mimes were very special, which enchanted me. Madhya Pradesh Adivasi Lok Kala Parishad, an academy of the tribal and folk arts organised Pandwani festival for four years at Raipur at my suggestion. I could witness there the performances of all the important performers, of different ages. Ritu Verma was only eight years old at that time. Laxmi Bai was above sixty-five and Jhaduram Devangan was the seniormost artiste. I documented Pandwani festivals in those years, which inspired me to work on a monograph on Pandwani. I worked a lot to trace out the sources and its gradual development from a tribal epic to the present day theatre form. This work could not have been possible without the inspiration and help from my friends of Madhya Pradesh Adivasi Lok Kala Parishad, particularly late Shri S.G. Khirwadkar, Dr. Kapil Tiwari, Naval Shukla and Vasant Nirgune. I thank all the Pandwani performers specially Teejanbai and late Shri Jhaduram Devangan, for the cooperation extended to me. I also offer my thanks to Dr. Yogesh Atal who has taken keen interest in my cultural studies and helps me in their publication. It is through him that I established my contact with Shri Shakti Malik of Abhinav Publications." He has already published my book on Bastar Bronzes. This is the second book. He has offered to publish my other monographs as well. I am thankful to him. Pandwani a mono artiste theatre form is based on the great Hindu epic Mahabharata. The word Pandwani means the Pandawa - Vani the legend of Pandawas. This legend is based on the Mahabharata and the text is followed from the Hindi version of Mahabharata prepared by Sabal Singh Chauhan. The name Pandwani can be traced to the tribal epic of Pardhan Gonds of Central India, which was known as Gondwana at the time of Moghal Sultanate. This legend has incorporated many tribal myths and their socio-cultural aspects. Pardhan is a sub-tribe of Gonds and the community is known as bards of the Gond tribe. The name Pandwani is actually for the Gond legend of Mahabharata, whose hero is one of the Pandawa brothers, namely, Bhima. This legend is part of the oral tradition of Pardhans. The legends which are in oral tradition are called 'Kapalika'. 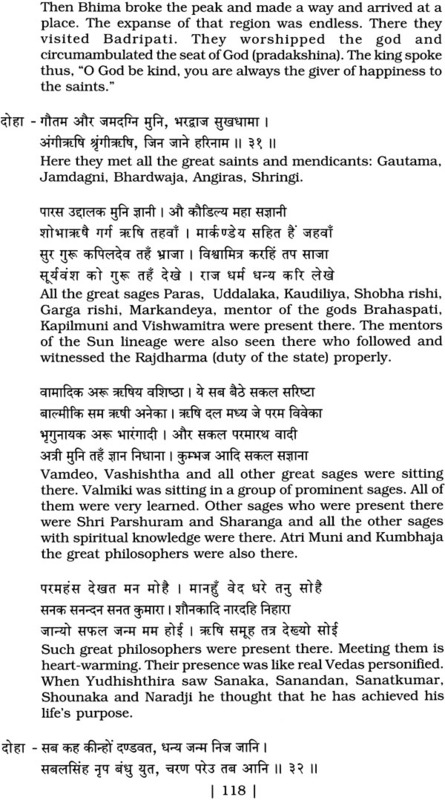 The legends with written texts are called 'Veda'. There are two forms of Pandwani: the 'Kapalika', which is based on oral tradition and the 'Vedamati', which means based on text. The present mono theatre form of Pandwani is based on the text of Sabal Singh Chauhan and not on the oral tradition of Pardhans but still it is called Pandwani. The documentation of the oral Pandwani was done and published in the year 1962. The documentation was done by late Shri Shaikh Gulab who was a folklorist and a school teacher, the text was edited by Dr. T.B. Naik, who was then the director of the M.P. Tribal Research Institute, Chhindwara. Mahabharata and Ramayana are the two great epics of India. Since two millennia these epics have been the main instruments and sources shaping the Indian psyche and society. These two great epics have so many versions and have even percolated into the most primitive tribal communities residing in the vast Indian territory. 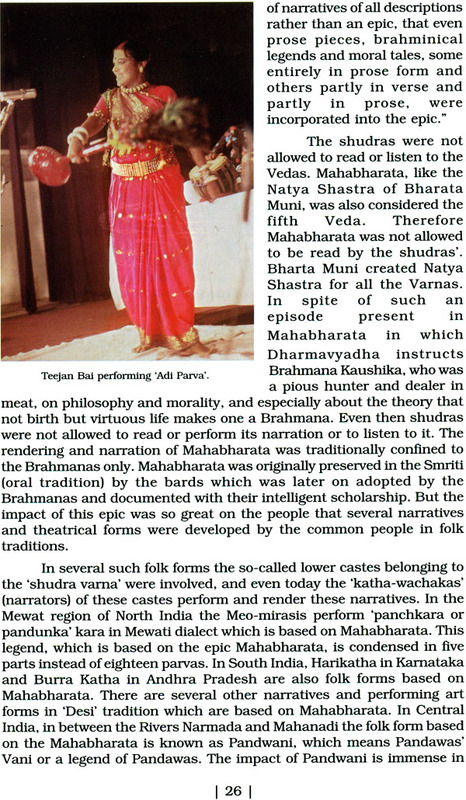 The source of Mahabharata legends and several narratives and performing art forms is the epic Mahabharata itself. The birth of epic Mahabharata is considered to be in between fourth century B.C. to fourth century A.D. "If an epic Mahabharata already existed between the sixth and fourth century B.C., then it was but little known in the native land of Buddhism. Between the fourth century B.C. and the fourth century A.D. the transformation of the epic Mahabharata into our present compilation took place, probably gradually. 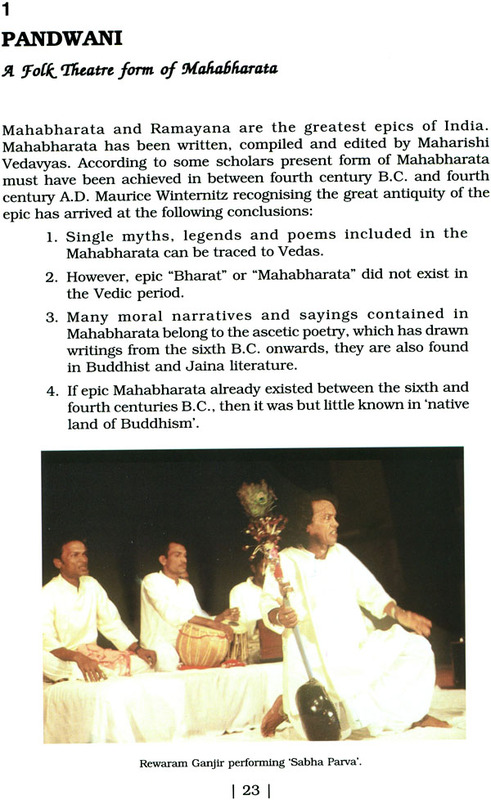 There is no testimony for any epic named Mahabharata before the fourth century B.C. 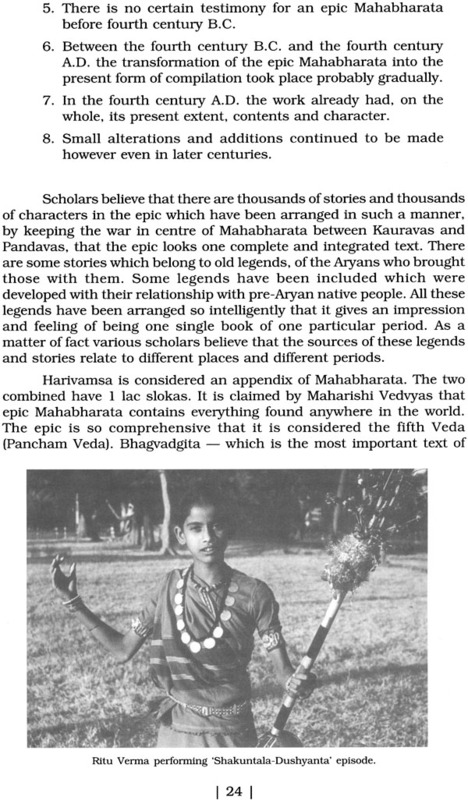 Mahabharata was neither written by one person, nor was it written at one point of time. It contains several stories which are also found in some other scriptures. "What is Mahabharata?" asks Winternitz. 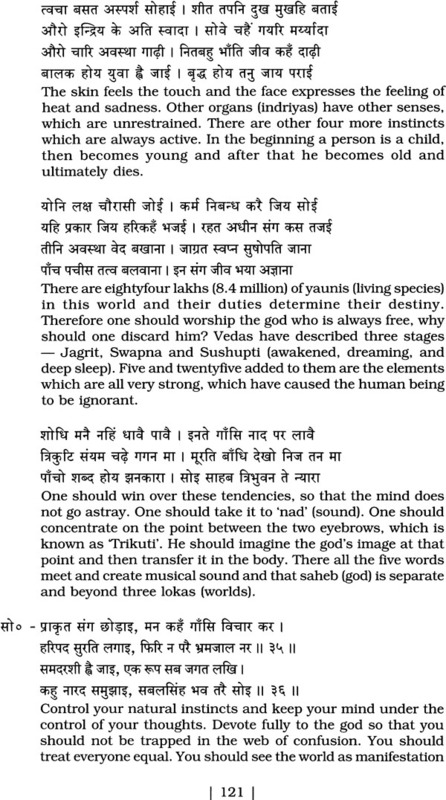 "It is only in a very restricted sense that we may speak of the Mahabharata as an 'epic' poem. 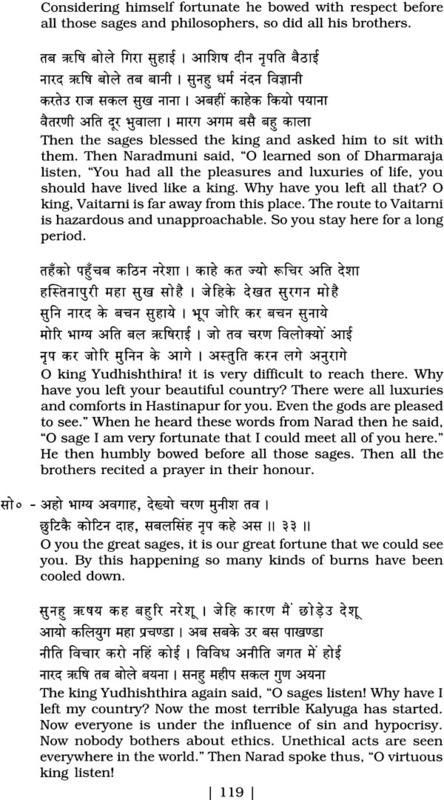 Indeed, in a certain sense, the Mahabharata is not ne poetic production at all, but rather a whole literature. 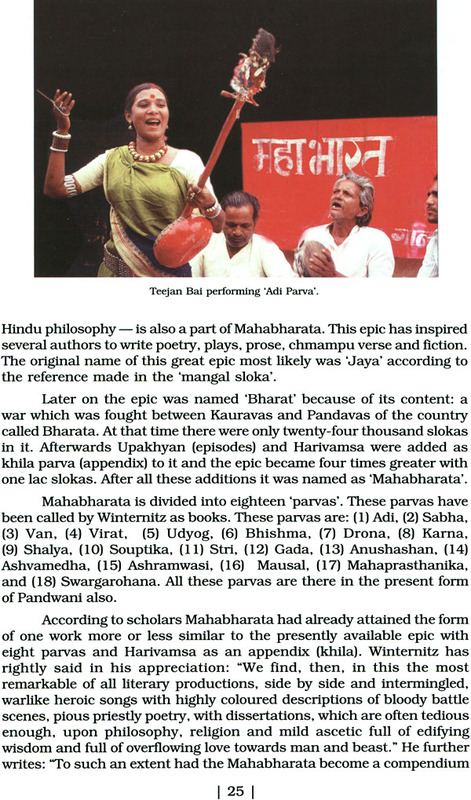 Mahabharata is a great narrative of the battle of the 'Bharatas'. They have been mentioned as a war-like tribe in the 'Rig Veda'. In the 'Brahmanas' we encounter Bharata, the son of Dushyanta and Shakuntala, who is regarded as the sncestor of the royal race of the Bharatas.